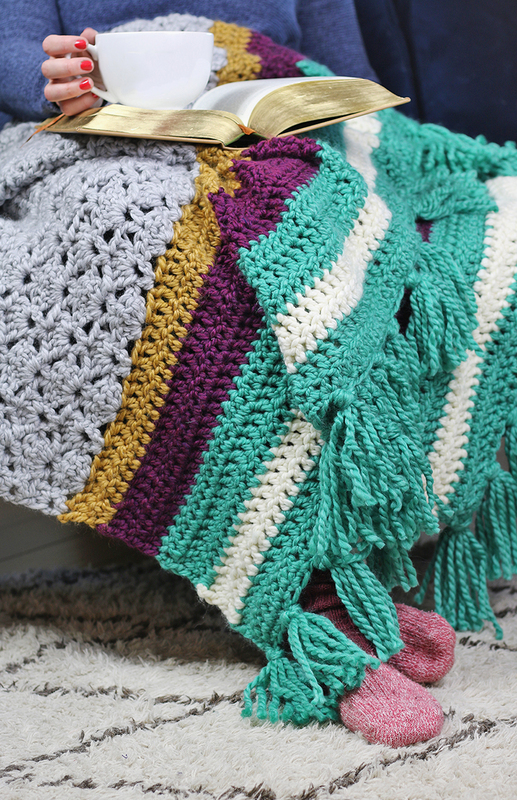 Make a beautiful, cozy, and colorful crochet afghan. This beautiful throw incorporates stripes, lacy stitches, and chunky tassels, and it will quickly become the favorite blanket in your home. 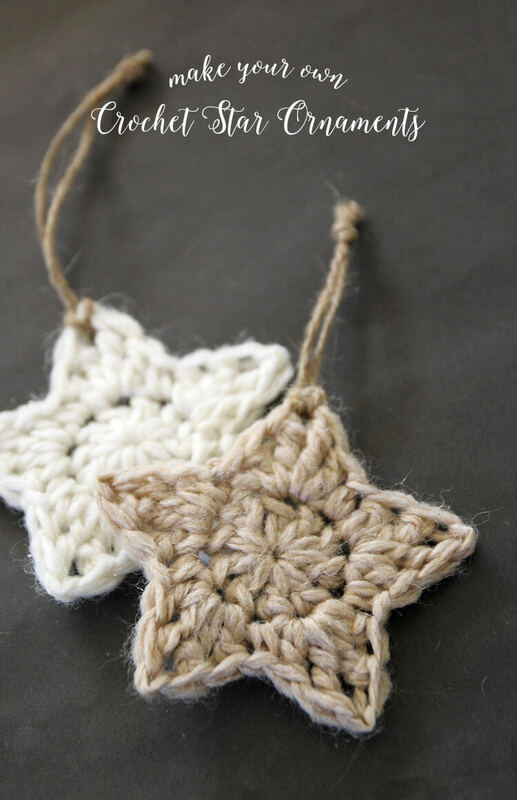 Learn how to crochet your own stylish home decor using this free pattern. I originally shared this design on the Darice blog. This post may also contain affiliate links, which help to support this site. Thank you! I’m a big fan of crocheting year round, but cold weather crochet projects are kind of extra special, right? 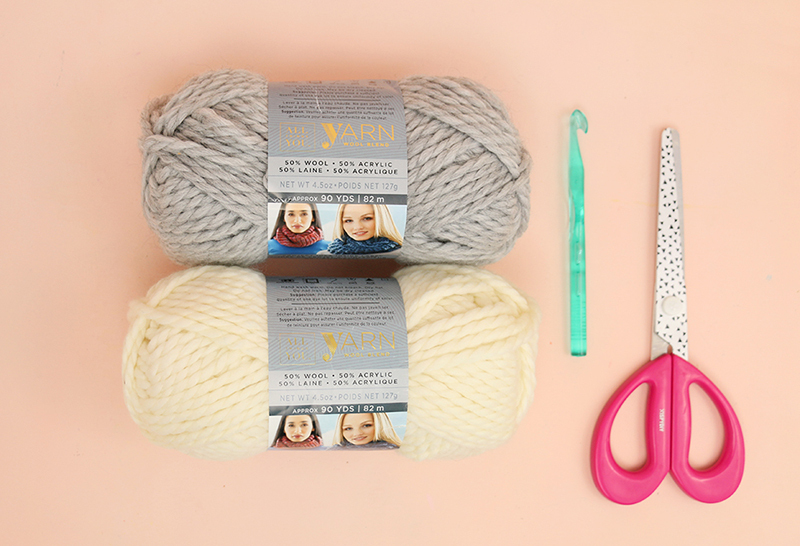 I am so excited to dive into all of those fuzzy, wooly, cozy projects I have been putting off until cooler weather. Guys – it’s officially crochet season! I’m kicking things off here with a new afghan pattern, which I’m calling the Hawthorn Afghan. I was inspired by the striped edges of Pendleton blankets and then combined that look with some lacier crochet fan stitches and fluffy tassels. I’m pretty happy with the way it turned out. The blanket was actually finished last winter, and in the months since it has definitely grown to be the favorite throw in the house, especially on cooler nights. 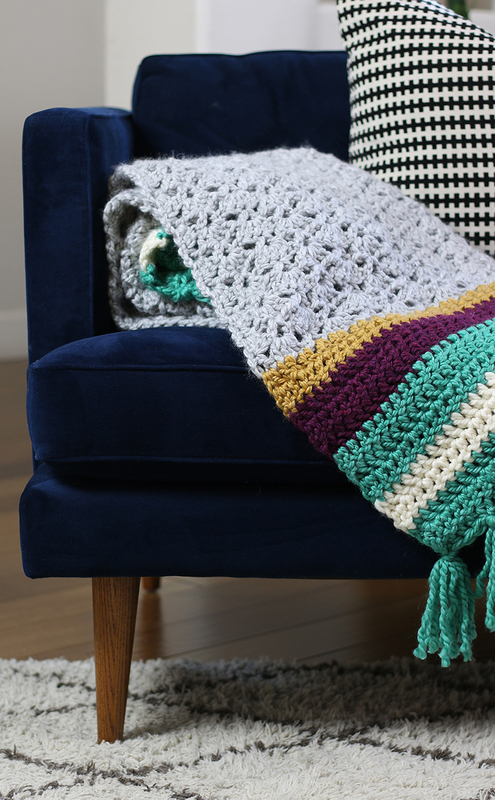 Ready to crochet your own cozy throw? Here’s everything you will need. 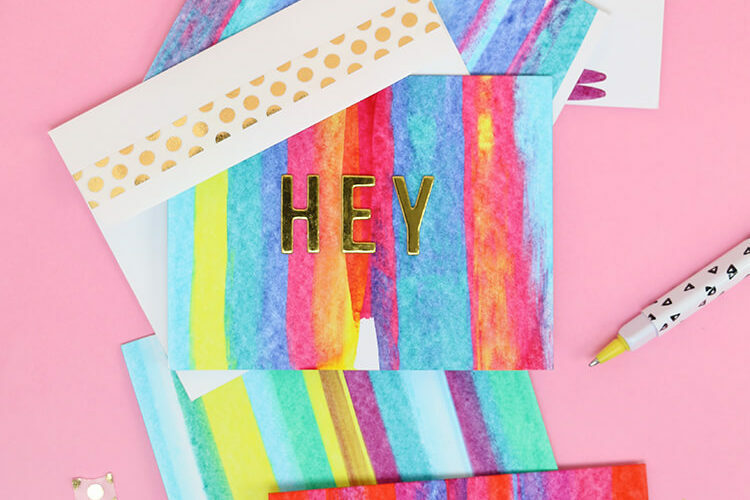 This pattern is free for personal use only. You may sell items made using the pattern, but please do not sell or redistribute the pattern in any way. If you want to share the pattern with a friend, please share the link. Thank you! This pattern uses American crochet terms. The finished afghan is about 52” wide by 60” long. Row 1: Working with Color A (green), Ch 90, dc in 4th ch from hook (skipped chs count as first dc), dc in each remaining ch (88 dcs). 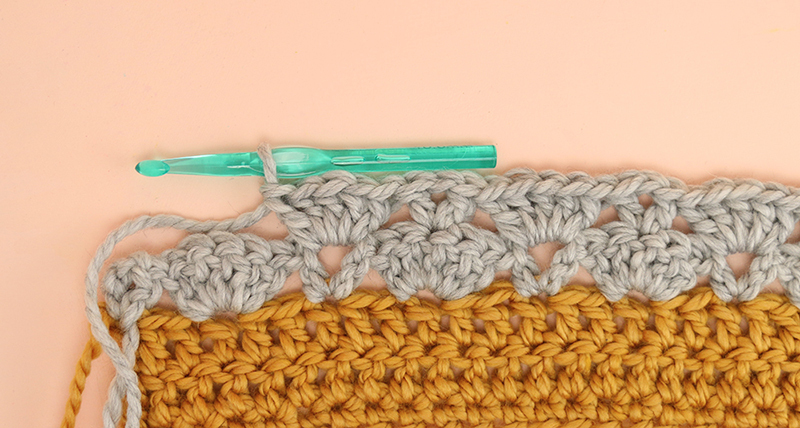 You can adjust the width of the finished afghan by starting with more or fewer stitches in the first row, just start with a multiple of 6 + 4 double crochet stitches. Rows 64 & 65: Ch 2 (counts as first dc), turn, dc in each st across (88 dcs). Finish off Color A. Weave in ends. 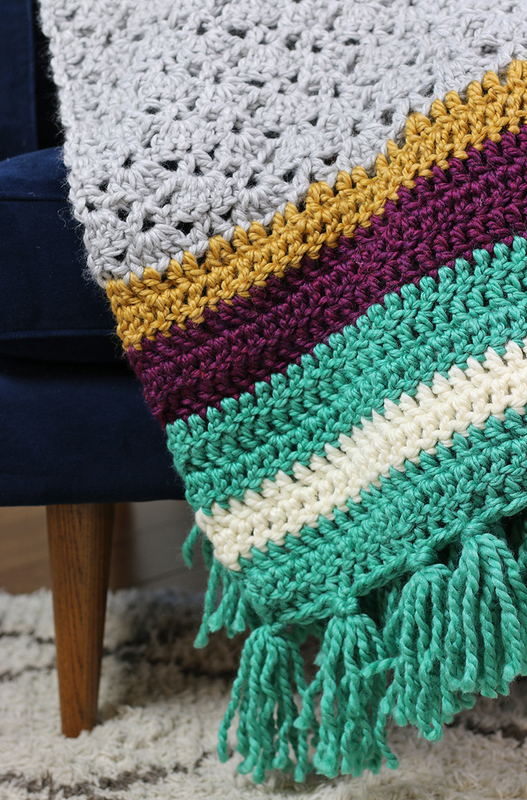 I think the big, fluffy tassels are really what makes this crochet afghan special, but then I’m kind of into adding tassels to everything these days. 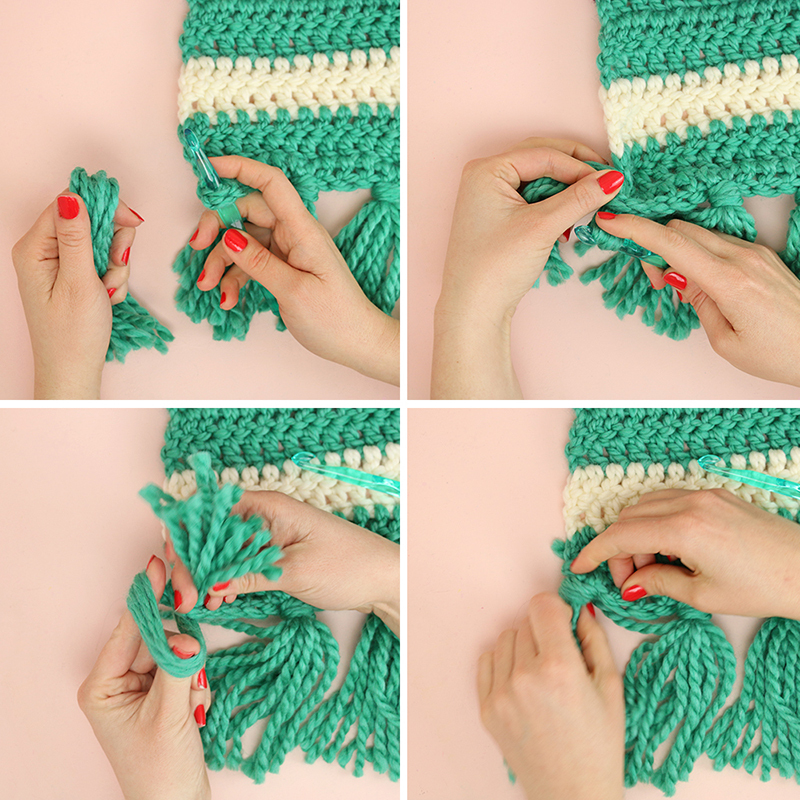 Here’s how to simply add some tassels to your afghan and make it extra fun. For each tassel, cut 8 lengths of yarn that are a little longer than double the desired finished tassel length. 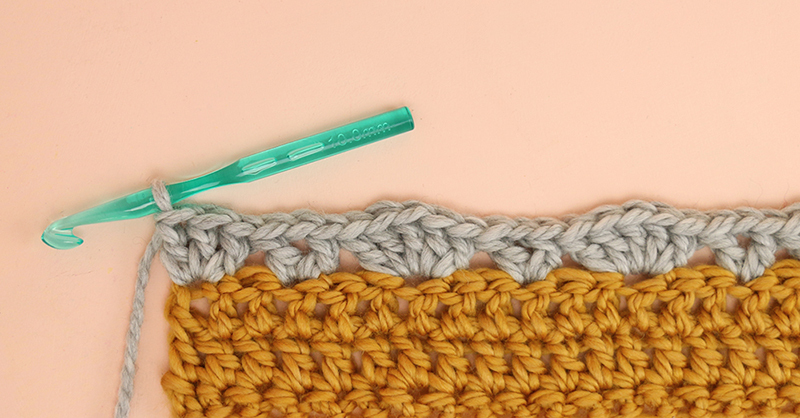 Fold the lengths in half, and pull the loop through a stitch on the edge of the afghan using your crochet hook. Pull the tails of the yarn through the loop and pull to tighten. Repeat this process for each tassel. I spaced my tassels four stitches apart. Use scissors to trim up and even out the length of the tassels. 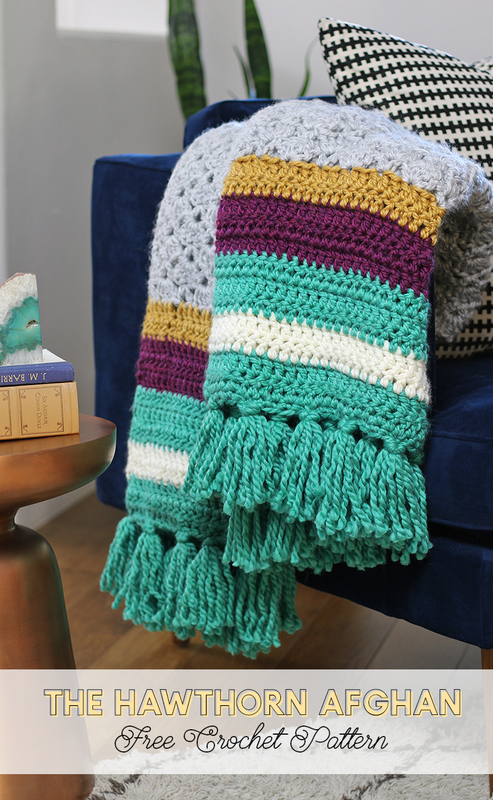 After your tassels are attached, you are all done and your pretty afghan is all ready for cozying up with a great book. If you make your own Hawthorn afghan, I want to see it! You can share your photos to my facebook page or tag me on instagram. Hi Connie! I don’t think a #5 bulky yarn will work with this pattern. You would have to adjust the number of stitches considerably to make it work. 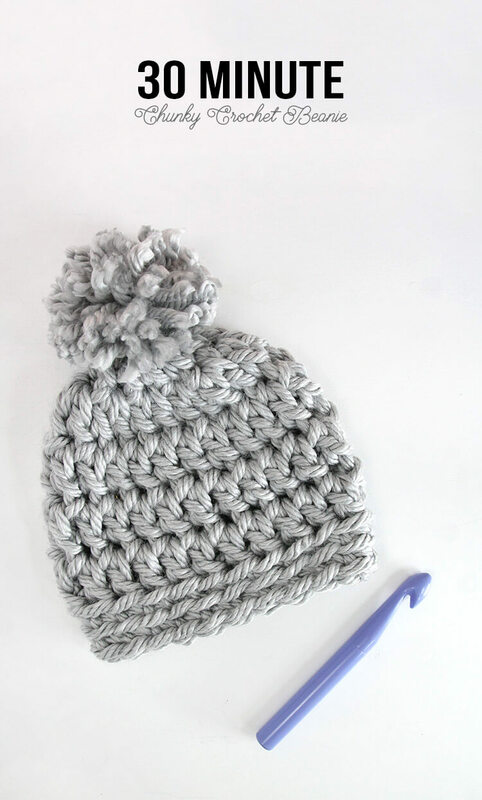 This hat would work with that size yarn: https://persialou.com/2015/11/chunky-ribbed-slouch-hat-free-crochet-pattern.html Good luck! I am looking foot a long scarf using Berber bulky yarn. I made the get & I would like a scarf to go wit h it. Any help? 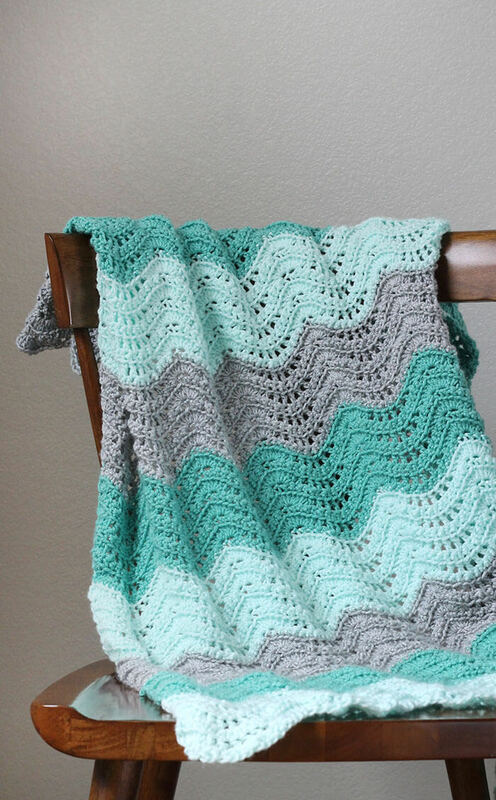 This is so beautiful, I will be trying this pattern for my next blanket project! Thank you for sharing this! Do you think Lion Brand Wool Ease Thick and Quick would work up with for the Hawthorne Afghan? Thanks! Hi! Do you think Lion Brand Wool Ease would work well for the Hawthorn Afghan? Yes. I think that would work well. I believe it’s similar to what I used. Thanks so much! It’s working up beautifully ☺️ one question that I wondering if you have any advice for: I struggle with weaving in the ends of chunky yarns without it looking bulky or pulling free– do you have any advice?